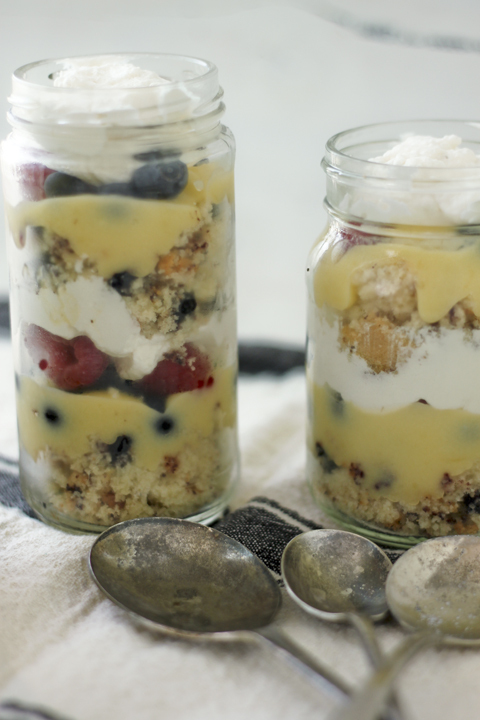 Blueberry Lemon Cake & a Trifle — always with butter. Oven 350F. Butter & flour a traditional sized bundt pan. Cream butter and sugar until light and fluffy. Add lemon juice, zest, eggs and vanilla. Set aside. Sift together flour, baking powder and salt. Add to butter mix, alternating with milk. Fold in blueberries. Pour into pan and bake for 30-40 minutes until toothpick comes out clean. Let cool in pan for 15 minutes then remove from pan and let cool completely. Mix sugar and juice together in a small bowl. Whisk until completely smooth. Drizzle over cake.